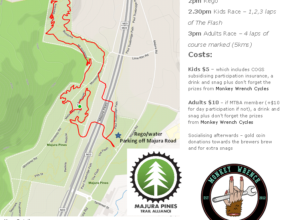 This COGS Race Series have been set up such that likeminded people can ride a course that has a few challenges that they would ride with their friends on a weekend ride. All riders need to ensure that they feel comfortable riding this sort of terrain because this is the type of course that we organisers will be setting during the race series, hence the 15+ minimum age. There are other races being held catering for mainstream riders with timing which may be better suited to some riders.